Ivory work was highly prized by religious and lay dignitaries alike in the Middle Ages. 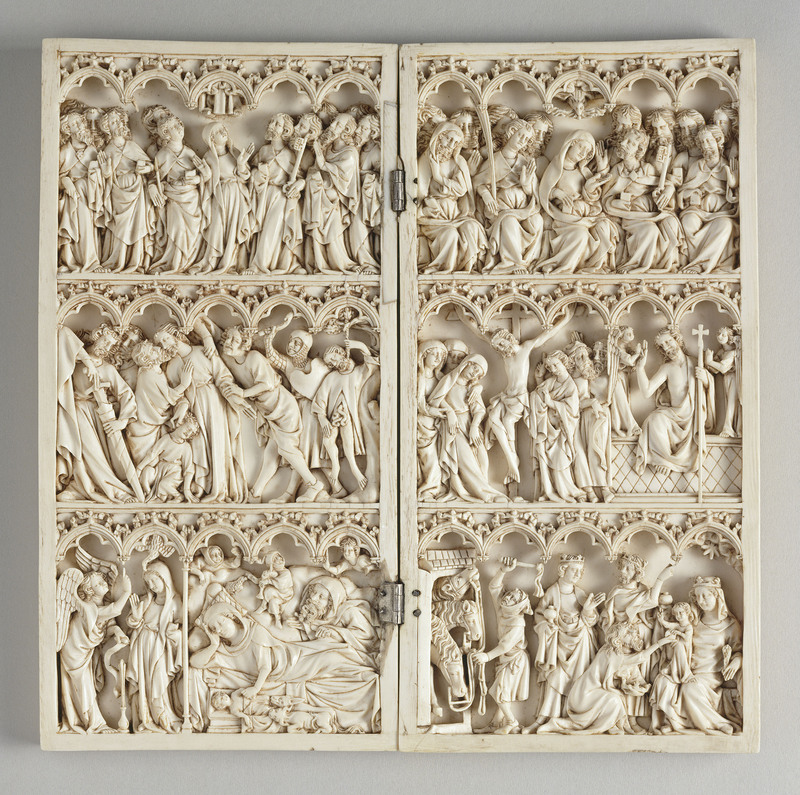 By contrast, diptychs, little altarpieces with two panels, carved in ivory were rarely seen prior to the reign of Saint Louis and only became commonplace in the 14th century. This was the period when those lavish art enthusiasts the princes of the Valois family, King Charles and his brothers – notably the duc de Berry – were keen ivory buyers. A diptych in the Louvre which most probably featured in the collection of Charles V shares certain characteristics with the example in the Petit Palais and others held in the Louvre itself, in Madrid, Lisbon, London, Berlin, New York, Baltimore and Minneapolis. The death of the king in 1380 is a valuable chronological reference point for the activity of the workshop which is conventionally known as the workshop of the Passion of Christ. The two panels of the elephant ivory diptych are divided into three superimposed levels separated by trefoil arches surmounted by foliate crockets. The scenes illustrate the life and Passion of Christ: on the left are the Ascension, the arrest of Christ and the hanging of Judas, the Annunciation and Nativity, and on the right are Pentecost, the Crucifixion and Resurrection, and the Adoration of the Magi. The workshop’s output is characterised by the elegance of the figures and the silky softness of the drapery. The faces are quite stereotyped: a long straight nose and prominent cheekbones for the men and a pointed chin for the women. Although the pieces are very similar, they are not identical. Thus the draperies of the diptych in the Louvre have more vertical and deeply-carved folds than those in the Petit Palais, where the figures’ cloaks are wrapped around their waists and fall as an apron, harking back to a style of sculpture and illumination particularly prevalent in the first half of the 14th century.